The little things are of utmost significance. Why so? Let’s show you. Lyra’s Anglo- Indian friend really looked up to having ‘gaajar ka halwa’ after sitting through an episode on TLC. Nothing would make Lyra happier than tripping her friend up on Indian dishes and that too home-made. The idea met with despair as they did not have access to a Grater to make the work easier. A Peel in Time saves just fine. While Indian ceremonies are big and fat, so is the preparation to pace up the occasion. Three-four women sat together on the kitchen floor chopping vegetables and peeling garlic, onions, etc. It takes forever to peel with a regular knife and to add fuel to fire, the knives sometimes are blunt and demotivating! A stitch in time saves nine. 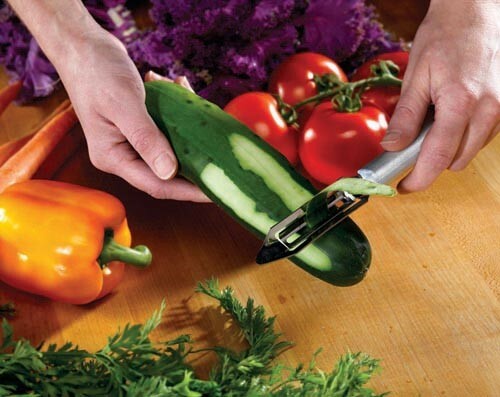 Here, the Peeler! When it comes to feeding your child’s imagination, God help your patience levels! Rory now likes cheese only if it looks like tiny pieces of snow. Where did he find such a description? He picked that up from school, his friend Nysa always has cheese like “tiny pieces of snow”. So, his mother had to really make sure he got cheese sliced into thin shreds so that Rory takes his tiffin seriously. Also, it looks better this way, cheese trimmed to thin shreds of perfection. When the Pizza is delivered and friends come rushing to hog, it looks nothing less than a carefully plucked out scene from a war- movie (given your heights of imagination)! And while the fight continues to tear the pizza slices from the whole, chunks of chicken from one pizza falls, chunks of cheese from his pizza piece clings to mine and, the battle continues. So much drama over Pizza! Make sure you HAVE a PIZZA CUTTER. Saves pizza, and relationships! FnS Kitchen Tools makes you relish your delicacies without the daily hassles. Bring them home. Thank us later! Appreciating the time and effort you put into your site and in depth information you provide. It’s good to come across a blog every once in a while that isn’t the same unwanted rehashed information. Great read! I’ve bookmarked your site and I’m adding your RSS feeds to my Google account. Previous Previous post: What’s cooking in your Life?